We try not to make a big deal over my son's peanut allergy whenever possible. It is my responsibility to monitor my child's safety, not yours. We say sometimes that it's not very hard yet to handle Big Bro's nut allergy since he's at home and we control everything that goes in his mouth. This is true - at least - as compared to the challenges I expect in the future. But even so, there is not a moment outside of our home or around other people that there is not a part of my brain devoted to Big Bro's safety and the presence of nuts in his environment. ~A well-meaning stranger at a party gives Big Brother A the food I just said "no" to. He thinks he's being funny by sneaking around my rules. I have to explain to him - with grace and firmness - that he is actually endangering my child. And then I have to take the food away from my excited toddler who cries because he doesn't understand why he can't eat the muffin someone just gave him. ~A kid at the zoo eats their PB&J in the glass underwater viewing room - and smears it all over their hands, face, the windows, and the benches in the room. The parent looks on. Now looking at polar bears up close is dangerous for my son. ~Big Brother A sees garbage on the playground. He wants to be helpful and clean up and I have to grab him before he touches the peanut butter granola bar wrapper. ~A family at the spray park sits down to eat their lunch and doesn't move our pile of things before starting on their peanut butter sandwiches (RIGHT over our things). I can't dry or dress Big Brother A in those things anymore, so I have to pack them up like they're poison, dry him with my extra shirt from the car, and send him home in wet swim trunks. Those are just a few examples, but these things happen so frequently. What do you feed your child when you're in a hurry? When there's no refrigerator? When you just want to be out for the whole day without spending a ton of money on lunch? PB&J. 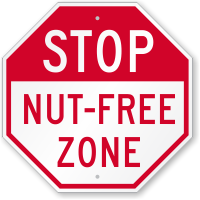 Some places have nut-free tables; most do not. We have to scrub the area where Big Bro A will be sitting, and if he scoots down the bench to a different spot, we start over again. And mulch/sand/dirt? Who knows if those are safe or not. It's a gamble every time. We go to a playdate and a child has food dried on their face. Is it peanut butter? We play with toys at the doctor's office. Did the last kid wash their hands after their peanut butter toast breakfast? We go to the store and Big Bro grabs at something colorful in the checkout. Is the outside of the honey roasted peanut snack pack contaminated? I totally understand that nuts are not poison for everyone. I really don't expect everyone to lock up their peanut butter and totally sanitize their children before going out if they've happened to indulge in any. I try not to be all about Big Bro A's nut allergy. We do not want that to be our family identity. We definitely don't want him growing up as "The Nut Allergy Kid". We want to be respectful and understanding in our approach to his allergy and keeping him safe. But I do often wish that the general public could be a little more aware that certain foods are, in fact, poison for some people. I know that we've come so far in the last few decades. Food labels are a great example of that. The system is far from perfect - way too much of the labeling process is still left up to the manufacturer's discretion. I do recognize, though, that this is progress. But sometimes it's still a very scary world out there with our peanut-allergic toddler. I so appreciate our dear friends who go above and beyond to keep Big Bro safe while helping him to feel normal. I appreciate the people in our lives who have learned about reading labels and asking the right questions when we're eating out. Many times people have brought safe snacks just for him, even when they really didn't need to. That is such an expression of love to our family, and we really do notice! If we visit you and we ask to read labels, or ask if you could wash your table/hands/food scissors before a meal, please don't feel insulted. I hate to ask, but I'm responsible for my boy, and I'm having to grow past my fear of confrontation to keep him safe. I'll try to do it politely. It's not that I don't trust you. It's that I want every judgement call on safety to fall on me or my husband, so that we alone carry the responsibility for any reaction he might have. If you're not sure about how to treat nuts or other high-allergen foods, maybe think about it like this. We wouldn't ask you not to take Ibuprofen in a roomful of children. If you've got a headache, you need it. If your kid has a fever, you need to use it. But we would certainly expect you not to offer it to anyone's children other than your own. We would expect you not to leave the medicine dropper in reach of other children, and not to send your child out into the play area with hands sticky from medicine. We would expect you not to leave the bottle of medicine in reach of children. If you're not sure how to handle peanuts or other high-allergen foods, maybe start to think of your food like you would a bottle of medicine. Oh, and lastly, if I ever swoop in like I'm saving the day and grab your child's peanut butter sandwich from them, just politely ask for it back and let's pretend it never happened. I live so much of my time watching out for this huge danger in my family, that it is very hard for me to remember sometimes that nuts are not dangerous for most of the world. So just kindly continue feeding your child and give me some extra grace!